As I mentioned in the introduction, our drive from the airport was arranged by the hotel but contracted to TransCabo. They didn’t have car seats for our girls. But, the short ride from the airport was quick and painless. Upon our arrival at the Ziva, we were greeted by the bell staff who took our luggage while we went to the premium check-in area due to my new Diamond status. The open-air lobby really is stunning and provides a fantastic first impression of the property. Choosing when housekeeping comes is actually really helpful for us because my youngest daughter still naps in the afternoon. On other trips, we’ve skipped housekeeping to avoid the 2pm knock on the door. The first full day of our stay, there seemed to be some confusion about when to service our room. I think our request of anytime before 2pm was communicated as a 2pm checkout time. But, we talked to the front desk and everything worked well the rest of our trip. Shantal was also able to help us with a $100 spa credit offer for having the (no longer available) Hyatt Credit Card, which we received an email and postcard about before our trip. When I brought up the deal, Shantal said the normal process is a voucher is mailed to you after booking using the number on the promotion. Our points and credit card night were booked using a different phone number. So, we were not mailed a voucher. Before our trip, I proactively contacted Hyatt’s outstanding Twitter team to get clarification about the promotion. When I showed the correspondence to Shantal, she said she’d look into it and let me know. On our way back from lunch later that day, we ran into her and she said we were all set for the spa credit. Before we left for our room, I asked about the possibility of a paid upgrade to a one-bedroom suite. Shantal quoted a rate of more than $400 per night. So, we stuck with the room we were assigned. In the map below, our room was near the number 8. 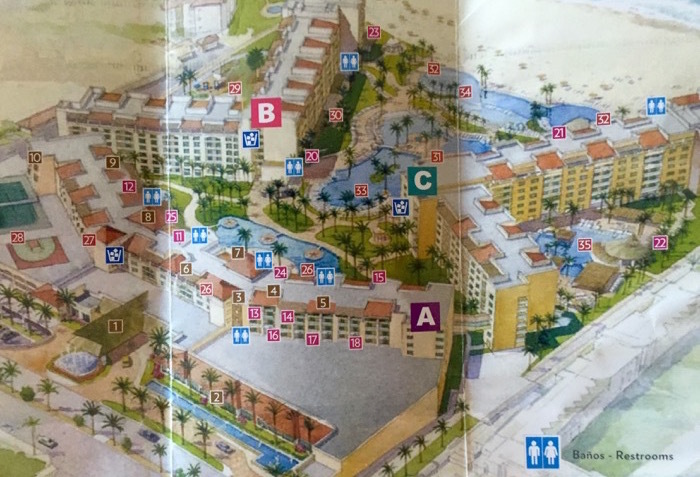 Our room was in the main building (A in the map above) a few floors above the lobby. We had a short walk from the elevator along the open air hallway. As you enter the room there are a couple of closets and the minibar on the right and then the bathroom is on the left. The bathroom had double sinks and plenty of counter space. To the left of the sink was a partitioned toilet area. Then to the right of the sink was the large shower and jetted tub. You could open the shutters between the bathroom and bedroom to make the room feel larger. The room had two double beds with a nightstand in between. The beds faced a flat screen TV. There were plenty of plugs throughout the room. I particularly appreciated the USB ports, which helped keep phones and iPads charged throughout our trip. Beyond the beds was a couch, which could convert into a bed if you need it. As is often the case with a pullout, the sofa was quite firm. There were also a couple of chairs around a small table. A welcome gift was left for us on the table. While it’s a nice gesture, I couldn’t help but think it was unnecessary at an all-inclusive resort. The best feature of the room was the view. I spent most mornings sitting on the balcony watching for plumes of water from the whale’s that are in town. Very rarely, you could see a big enough splash in the distance that a whale must have breached. It was also nice to have a visitor half way through our stay. We helped relocate this little guy back outside. The room was large enough to meet our needs. The beds were a little firm and the chairs and sofa weren’t particularly comfortable. But, we didn’t spend much time in the room because there are plenty of things to do at the resort. The view was fantastic and the balcony was a great place to relax in between trips to the pool or beach. What is the tipping practice at an all exclusive? I completely disagree with tipper. I went to Zilara Cancun, and they were clear that tips were included and I never felt any pressure to do any additional tipping. All inclusive means everything included? Even the drinks in the cooler in your room? What was not included? I was at Zilara Cancun and yes, everything is included, even drinks in your room. 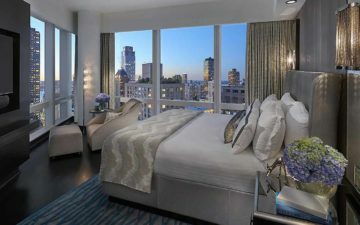 Some restaurants require a reservation and the Chef’s specialty restaurant is only bookable if you’re in a premium room. It’s a pretty decent all-inclusive hotel with a variety of dining options. 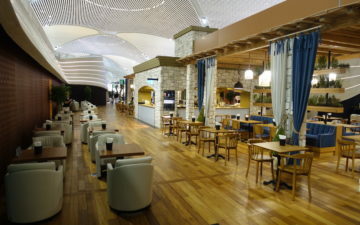 There is also a 24 hour lounge with food as well as room service. The only downside during my stay was that the TV wasnt working and I was told they were in the middle of changing TV providers. I didnt care much for in-room TV anyway so I didnt press it. I was able to book 4 nights via the Citi Prestige card and at a 55% discount in addition to the 4th night free for a standard ocean view room. I thought it was a fantastic deal. As for tipping, i dont believe its required but I always left a tip after meals, drinks at the bar and housekeeping because thats how i roll. It wasnt much either – US$1-2 each time. I stayed at this property over Thanksgiving and loved it. The staff was great, food was good (especially the lunch tacos at the little poolside cantina), and it’s a short cab ride into San Jose del Cabo. Note that San Jose is NOT Cabo San Lucas, which is more of the spring break party town. San Jose is much smaller and more laid back- a lot of art galleries and nice restaurants. My only complaint was that I called Hyatt to use a Diamond Suite Upgrade certificate on my room, and they gave me the same room as above. I was kind of mad, but ended up getting the DSU cert credited back to my account afterwards. You need to try the new Ziva Cancun – we just got back and it was amazing. As for tipping, I usually tip $1 per item. So a dollar a drink at the pool or bar and maybe $10 for a multi course dinner with drinks. Spent a week at the Hyatt Ziva Cabo between Christmas and New Years. Great Place. Check-In was a mess and frustrating, but I find that seldom goes smoothly. After check-in, everything was great!!! A full eight days, and our only charge were spa treatments my wife and I treated ourselves to. We also did an excursion, which was a little over $100/person. As for tipping, I brought about $100 in ones with me, and probably spent $60-70 on tips. Mike (comment above) is about right. $1 per item (drink) and maybe $2/person for dinner and sit down meals. $1/person for buffet. Whether it’s included or not, 1) about $10/day is a small price to pay to show your appreciation for good service 2) these workers need it a lot more than you do (since you’re staying at a place that runs roughly $500/night (and even if you’re on points, that’s even more of a reason to spend $10/day on tips). They workers truly appreciate it, and although I was never made to feel obligated to tip, I felt the workers definitely appreciated it. We tipped pretty much as described by other commenters. $1 per item and $1 per person at buffets. Then we tipped more at the a la carte restaurants in the evening. There were plenty of people who didn’t tip and none of the servers seemed upset about it. But we thought it was an appropriate acknowledgement for the very warm and helpful service from everyone at the Ziva. @Credit – They have a premium wine list you can order from that isn’t included. It will be part of the restaurant post. Spa services are also an extra charge. But, as far as anything in your room, it’s all free. I never tip at buffet style restaurants where you get up and serve the food yourself. I guess being from Australia where tipping isn’t customary (as we have one of the highest minimum wages in the world) this concept is all a bit foreign to us. I remember being in Las Vegas last year and going to the buffet at The Excalibur where you paid upon entry and there was a space for a tip on the bill. Needless to say I didn’t tip because I thought the only thing they will do is show me to the table, everything was self-serve, including drinks. I didn’t get a great look though from the cashier when I just paid the exact amount! Ivan – in Vegas, tips at the buffet are usually in cash left at your table for the server who gets your beverages and clears your table. Most people don’t put the tip on the credit card slip when they pay on entry – well, at least I don’t – you don’t know what kind of service you’re going to get yet. The cashier wouldn’t even care because they don’t share in the tips. If the cashier gave you a dirty look, it must have been for another reason. Is “Bottomline” now one word? Can you confirm your room type you had?